2. I had “foodie” plastered on my forehead and she was intrigued by the snacks I brought to class. The pretzels soon disappeared off the shelves, and left me with no other choice but to move on. Miss Vicki’s then introduced their epic Jalapeno flavoured kettle chips which kept me excited for a while. And then there was a lull…until yesterday. I was at that same local grocery store and was expecting only to pick up a baguette. A display of large red bags caught my attention. They screamed, “You want me, I know you want me ;)”. With a plea like that how could I say no. Hailing from Popcorn, Indiana (a real town, and also the company’s name) this red bag was filled with the most sensational gourmet kettlecorn popcorn. “Crispy and Crunchy. Sweet and Salty”, the label took the words right out of my mouth. This popcorn was perfectly balanced, and delivers on the company’s word. Each handful is always different, unleashing a curiosity that had me dipping my hand into the bag for more. 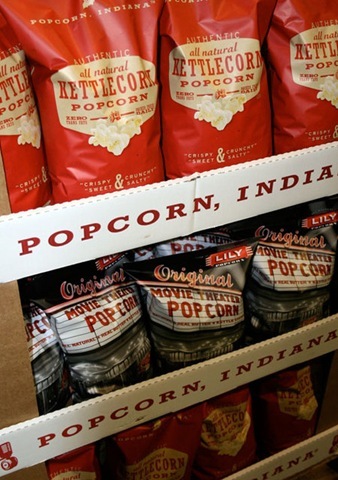 The shelves were also stocked with Movie Theatre Style popcorn, but were missing the company’s Aged White Cheddar Kettlecorn, Smoked Cheddar Cheese Kettlecorn, and Sea Salt Popcorn varieties. At $3.99 for a 297 gram bag, the price is a little steep for typical snackers, but well worth it. At this rate, it’s will only be a matter of time until the extremely pricey Kernels is put out of business.